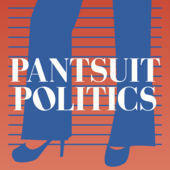 Pantsuit Politics: A political podcast hosted by women from both sides of the aisle who refuse to see each other as the enemy. Political Gabfest: The kind of informal and irreverent discussion Washington journalists have after hours over drinks. Kentucky Politics Distilled: A weekly rundown of the big news - and sometimes the odd news - happening in the Kentucky state Capitol. Uncivil: Go back to the time our divisions turned into a war, and hear stories left out of the official history.